This month, we decided to take a look back at January 2016 and compare it to our first Bubble Map of 2017. Last year at this time oil prices were in the basement. In our January 15, 2016 blog, WTI was listed at $29 per barrel, with Brent in the same spot. Oil prices are definitely looking up in 2017, with WTI at $53 per barrel on January 24th. Brent is at $2 above WTI. The Western Canadian Select discount is at $14 under WTI. On the Gulf Coast, crude oil from the shale formations in Texas like Eagle Ford were priced at parity with WTI, and Louisiana Light Sweet is at a little more than $1 over WTI. On the West Coast, the Alaska North Slope differential is $1 under WTI. The San Joaquin Valley Heavy discount is at $6 under WTI. To say that a lot has changed since last year is an understatement. 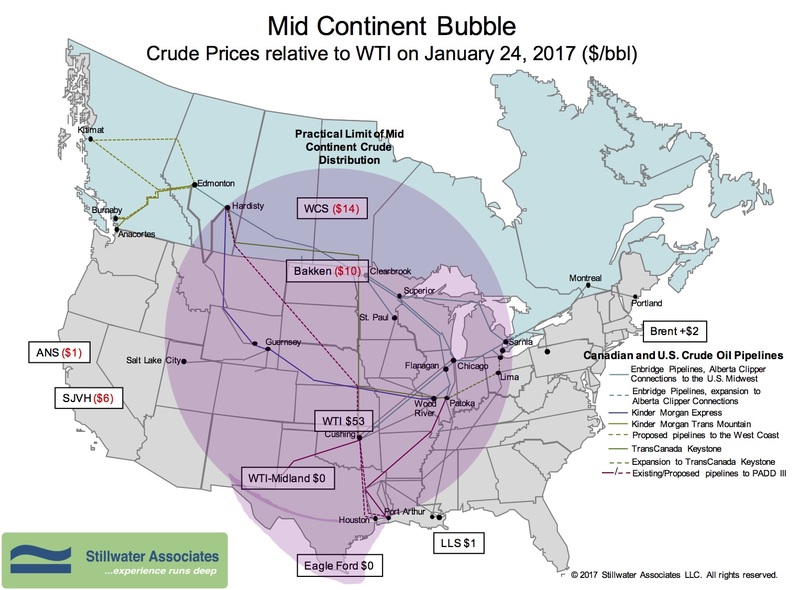 The super cheap price of oil caused many Mid Continent crude producers to shut down or consolidate in 2016. Now that OPEC has reduced production, and prices have broken $50, the U.S. oil rig count has gone up, especially in the Permian Basin. In 2016, the controversial Keystone XL expansion through Nebraska was essentially dead. The Dakota Access Pipeline (DAPL) came back under environmental review. On January 24th, President Trump signed an executive order to revive those efforts. It remains unclear how the executive order will expedite the environmental review for DAPL. However, it is clear the new administration’s priorities are to undo, or slow down the Obama administration’s environmental protection efforts. Another change that may be on the horizon is the House Republicans’ proposed Border Adjustment Tax (BAT) on imports. While the likelihood of this idea becoming law is in question, it has been an ongoing topic of conversation at Stillwater. The consensus among Stillwater Associates is the likely impact of a BAT on the transportation fuels market would cause refiners to aggressively pursue domestic crude oil because it would be cheaper than imported crude. This will drive up the price of domestic crude until it achieves import parity. The biggest winners would be domestic crude oil producers. We’ll be watching and providing analysis on all the changes to the transportation fuels industry that come with the new administration.